Harry Potter at the Galter Library! This is a blog about pharmacology, chemistry, biology, but most importantly: humanity. Tell your friends about this blog! Early in the morning of July 12th 2016 , the police in the Bedford-Stuyvesant area of Brooklyn, NY, were alerted to strange events occurring around the subway station at Myrtle Avenue and Broadway. According to the reports , numerous people, all men, were seen staggering around in a zombie like state making horrible groaning noises. Once the police arrived they found a scene that resembled something out of Shaun of the Dead. Movies posted on social media rapidly made their way round the world where a shocked audience could view the events in real time. Thirty-three men, ranging in age between 29 and 58 years old, were found to be completely incapacitated. Many of the men stared fixedly into space as they stumbled along aimlessly, moving their arms and legs very slowly like automatons. Emergency workers transported 18 of the men to the Woodhull medical center where they were reported to be suffering from “altered mental states”. It seemed obvious that the victims must have have taken some type of mind altering drug. Indeed, events like this were quite common in the area, although this particular case seemed to be worse than the others in terms of the number of people affected and the seriousness of their condition. The profound psychological symptoms displayed by this group of men differed somewhat from the victims of previous incidents who had also suffered symptoms such as psychosis, delirium, cardiotoxicity, seizures, acute kidney injury and hyperthermia. But what was the drug they had taken, and how had it turned up in this particular area of Brooklyn at this particular time? A foil package was found on one of the victims labeled “AK-47 24 Karat Gold” and was sent to an expert laboratory at the University of California Medical Center in San Francisco to try and identify the drug responsible. The package contained some dried up looking plant material that resembled tobacco or cannabis (marijuana). The scientists extracted the samples and applied the latest chemical identification methods to the extract. The answer turned out to be a substance known as AMB-FUBINACA. It was a conclusion which made a lot of sense. Substances like this had been turning up all over the world resulting in incidents similar to the events in Brooklyn. It was a worldwide phenomenon that encapsulated all the problems associated with the confluence of designer drugs, underground illegal drug laboratories and the Internet. AMB-FUBINACA is what is commonly known as a synthetic cannabinoid, meaning that it was designed to mimic the effects of cannabis, which it does in many important respects. But clearly the drug was having effects on people that are not normally associated with smoking cannabis. It was much more dangerous. To understand where it came from, what it does and how it became part of a new designer drug problem, we will have to briefly look at the history of cannabis. shape (Fig 1). Tiny glands found all over the plant secrete a sticky resinous material which is the richest source of the psychotropic drug with which it is associated. One of the most important uses for cannabis since ancient times has been the production of hemp cloth which is made from the fibrous stems. 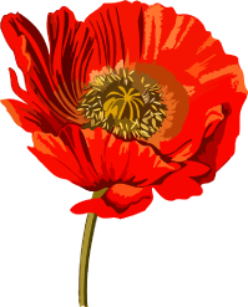 A useful oil can be made from the seeds of the plant. All parts of the plant can be used as a source of medical and psychotropic agents but these are most concentrated in the resinous material. 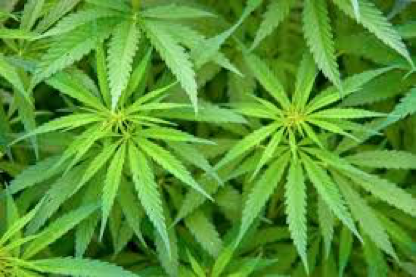 Cannabis is referred to in ancient pharmacopeias from China, India and other parts of Asia, as well as in the texts of both Hinduism and Zoroastrianism. Preparations of cannabis were used historically throughout Asia for many different medical problems including pain, nausea, insomnia, inflammation and a host of other indications. The major pharmacopeia of the Zoroastrians listed cannabis as the most useful plant known to man. Cannabis eventually made its way to Europe and America in the 19th century courtesy of Napoleon’s troops who had encountered it in Egypt. The drug became the darling of Parisian bohemians such as the Club des Hashischins, a group of writers who congregated around the poet Charles Baudelaire. In America, the effects of cannabis were widely disseminated particularly through the writings of Fitzhugh Ludlow in his 1857 book “The Hasheesh Eater”. Tinctures of cannabis were sold by American pharmaceutical companies like Eli Lilly and Parke Davis and were also used as ingredients in many patent medicines. psychotropic molecule(s) proved elusive. The concentrated extracts that could be prepared from cannabis had the character of oils and it became clear that the active molecule probably wasn’t an alkaloid but rather something like a lipid, a substance more like a fat. In fact, is wasn’t until well into the 20th century that the main active psychotropic molecule from cannabis was finally purified and characterized by Dr Rafael Mechoulam at the Weizmann Institute in Israel in 1964. The name of this active substance is △9-terahydrocannabinol (THC). Crude cannabis also contains many other molecules with similar structures to THC, such as cannabidiol and cannabinol ,but these lack the psychotropic effects of THC. All of these plant derived substances are known as phytocannabinoids (Fig 2). THC has a complex chemical structure without a nitrogen atom. So, it is chemically very different from many other natural products like morphine and other alkaloids. At room temperature, pure THC is an oily liquid that is almost insoluble in water. The pure drug, which is also known as dronabinol, is sold under the name Marinol. It is a restricted Schedule III drug which means that you need a prescription to obtain it, but it can be prescribed by physicians for a number of indications, particularly as an antiemetic for cancer patients. Remarkably, crude cannabis itself is a schedule I drug and, under federal law at any rate, cannot be prescribed because it is viewed as having “no medical utility”. This situation is rapidly changing in the USA with many states going their own way and either allowing cannabis to be used for medical purposes or even for recreational purposes. Overall, the Federal laws in the USA make little sense either from the scientific or medical points of view, but have a long history which I will review in a later post. A related subject of great current interest is whether many of the non psychotropic substances found in cannabis, such as cannabidiol, might also have interesting medical effects. A great deal of current research is concerned with examining the possibility that substances such as cannabidiol can treat epilepsy in children. Some of these results are promising and I will post an article on them at a later date. How exactly does THC work? How does it produce its numerous effects in humans and animals? In my previous post on the Opioid Epidemic, I introduced the concept of a drug receptor. This is a protein molecule that is expressed by a cell and binds the drug. If the drug is an agonist it will fit into the receptor and turn it on, triggering important molecular signals in the target cell. THC works exactly this way. It turns out that there are two different receptors for THC named cannabinoid receptors 1 and 2 (CB1 and CB2). These two receptors are found widely distributed in the nervous system and in other tissues throughout the body. The CB1 receptor is mostly found in the nervous system, whereas the CB2 receptor is mostly found on cells outside the nervous system, such as the white blood cells that play an important role in our immune defenses. But why should we have cannabinoid receptors anyway? It turns out that our bodies all make substances which act very much like THC and these are the normal activators of cannabinoid receptors. These are substances called endocannabinoids and they were also discovered by Dr Mechoulam in Israel. THC works by mimicking the actions of these substances. Interestingly, the endocannabinoids are derivatives of a substance called arachidonic acid which plays a major role in the synthesis of many important types of biological signaling molecules. Another interesting thing to note about THC and the endocannabinoids is that, although they fit into cannabinoid receptors and turn them on, they don’t do this to the maximal extent possible, so they are called partial agonists. As we shall see there are other molecules that can act as cannabinoid receptor full agonists; that is to say they turn the receptors on to their maximal extent. The wide distribution of the two cannabinoid receptors, both in in the nervous system and the rest of the body, reflects the many known effects of cannabis such as its psychotropic effects as well as effects on appetite, pain and inflammation. Indeed, some of these effects are what makes THC and its derivatives attractive as therapeutic agents. The discovery of the chemical structure of THC raised numerous questions. In many respects these parallel the questions asked about morphine after its chemical structure was determined in the early19th century, as I described in my previous article on “The Opioid Epidemic”. In particular, scientists wondered how alterations in its chemical structure might change its effects and potentially produce novel therapeutic agents. The beneficial effects of cannabis are certainly of great interest and raise the possibility that derivatives of THC might be synthesized that were free of its psychotropic effects but still valuable in the treatment of pain, metabolic disorders, inflammation and many other things. So, it should be understood that scientists who began such investigations were not trying to get people high, they were carrying out basic scientific research on a most interesting scientific problem which had real promise in the area of therapeutics. However, as they say, “the path to hell is full of good intentions”. There were really two ways of investigating the “Medicinal Chemistry” of THC. One way was to start by making molecules that looked like THC, but introduced small changes bit by bit into its chemical structure to see what would happen, just as molecules like hydrocodone, oxymorphone or heroin, which were made at the start of research on the chemistry of opioids, didn’t stray too far from the basic structure of morphine. Although attempts to make synthetic cannabinoids date back to the 1940s (i.e. prior to the identification of THC), some of the first substances to be made in recent times were synthesized by large drug companies such as Pfizer and Eli Lilly in the 1970s and 1980s. For example, the cannabinoids canbisol and nabilone were developed by Eli Lilly in the 1980s (Fig 3). These molecules share many structural features with THC and so replicate many of its pharmacological effects, including its antiemetic effects. Nabilone is still marketed for this indication today making it a useful treatment for cancer patients undergoing chemotherapy as well as patients with fibromyalgia and other painful conditions. A series of synthetic cannabinoids was also produced by Pfizer around 1980 in a search to produce non opioid analgesic drugs. This program culminated in drugs such as nantradol and CP-42,096 which had similar properties to nabilone (Fig 3). 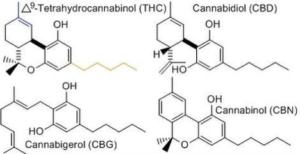 However, the program went a step further and synthesized a group of molecules which resembled the bicyclic molecule cannabidiol rather than THC itself. 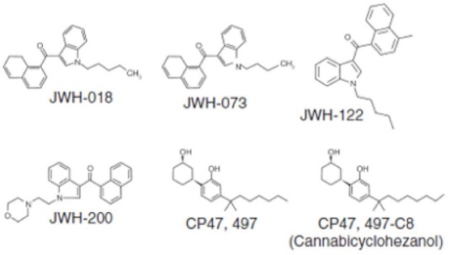 Somewhat surprisingly, many molecules from this series including CP (Charles Pfizer)-47497, CP-55244 and CP-55940 proved to have powerful THC like effects being considerably more potent than THC itself (Fig 4). Although such molecules never proceeded to clinical trials in humans they represented interesting advances in the molecular pharmacology of cannabinoids. The second method for producing synthetic cannabinoids relied much more on serendipity. Some of the first inklings of this appeared in the late 1970s when the Sterling Winthrop drug company was investigating drugs that were based on the anti-inflammatory agent indomethacin (Tylenol). One of their derivatives was a drug called pravadoline (Fig 3) which proved to produce an unusual profile of effects including strong analgesic and anti-inflammatory properties with additional THC-like psychotropic effects. Indeed, it was ultimately shown to activate CB1 receptors and act as a strong synthetic cannabinoid. The Sterling Winthrop company developed their interesting finding further and came up with the compound WIN 22152-2, a further derivative of pravadoline, with potent THC like effects. What is interesting to note about compounds like WIN22152-2 and pravadoline is that, although they have THC like effects and are strong activators of CB1 receptors, they are chemically completely distinct from THC or the synthetic substances discussed above that were made to resemble THC. This means that chemists had a completely novel chemical route for making new, potentially useful, synthetic cannabinoids. Fig. 4 John Huffman’s CB1/2 Agonists and the structure of some Pfizer (CP) agonists. these substances were full agonists at the CB1 and/or CB2 receptors (remember THC is only a partial agonist) and had powerful THC like effects when tested on animals. These interesting results were published in the scientific literature. It should be understood that when a paper is published in the scientific literature it contains a Methods section so that, given the necessary expertise and equipment, anybody should be able to produce the same results. In other words, papers published by drug companies or by Dr. Huffman, are actually recipes so that anybody can theoretically make the same things. They are not trying to teach people how to get high, it is the way science has to be done. But of course unscrupulous people might take advantage of their work. And that is exactly what happened. Somewhere in the early 21st century, somebody had a “good idea”. Cannabis was illegal at the time in most parts of Europe and the USA. However, the substances made by Huffman and others were not. It was pretty clear from what was already in the literature that taking these substances should get you high just like cannabis. Of course, doing so would also be profoundly stupid. Normally when a drug is released on to the market it has gone through tests to show that it does what it is supposed to do. Importantly, the tests also try to show that it doesn’t do what it isn’t supposed to do. In other words, that it doesn’t have unanticipated side effects that could be very dangerous or even fatal. We know that drugs like JWH-018, for example, have strong THC-like activity but they have never undergone full clinical trials in humans; so what else do they do? Remember many of these drugs are much better at activating CB receptors than THC itself and so might be expected to produce stronger or even different effects. They might also have effects on receptors other than CB1 and CB2. But, of course, if you are a drug dealer you aren’t going to worry about things like that. What you could do is something like this: take some dried plant material and shred it so that it looks kind of like tobacco. Then get a solution of JWH-018 or CP-47497 or some other synthetic cannabinoid and spray it onto the shredded plant material and let it dry. Now you can smoke this just like cannabis but, instead of inhaling THC, you would be inhaling a synthetic cannabinoid that might actually be much stronger than THC and had never been tested on humans. Products like this started to appear around 2004, mostly sold on the Internet but also in “head shops”, gas stations, convenience stores and other outlets. They were normally packaged in small foil bags with attractive names like “Spice,” “Spice Gold,” “Spice Diamond,” “Arctic Spice,” “Silver,” “Aroma,” “K2,” “Genie,” “Scene” or “Dream” -but these are just a few of many. The substances were normally advertised as being “legal” forms of marijuana, allowing you to reach a “legal high”, or had New Age-like associations describing them as incense for use in participating in mind expanding exercises. These products caught on rapidly and they began to morph in all kinds of different ways. By 2008, Spice-like products were attracting the attention of law enforcement agencies all over the world. It was found that all of these products contained one or more synthetic cannabinoids. Initially, these would typically be things such as JWH-018, JWH-073, JWH-122, CP-47,497 and JWH-250. Law enforcement agencies moved to place restrictions on all of these substances. However, as soon as they did this, alternative synthetic cannabinoids started to turn up to replace them. Not only that, but it became clear that many people who were using Spice-like products were suffering from serious problems. These were things like psychoagitation, delirium, acute kidney injury, seizures, psychosis, hallucinations, cardiotoxic effects, coma and even death. The situation with respect to the use of synthetic cannabinoids in many respects parallels events associated with the Opioid Epidemic, which I discussed in my previous post. However, in some respects it is even more difficult to deal with. First of all, there is no precise toxidrome as yet associated with the inappropriate use of synthetic cannabinoids. That is to say, the symptoms reported by people taking synthetic cannabinoids are so variable that it is not clear which of them make up a core set of behaviors that can easily be associated with drugs of this type rather than some other type of psychotropic drug. Secondly, there is the chemical nature of the drugs themselves. It is very easy for illegal laboratories to come up with new versions of synthetic cannabinoids that have not previously been found on the streets or even in the normal scientific literature. 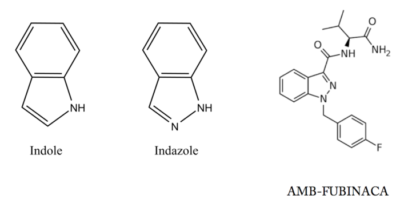 If we go back to the original CP or JWH compounds you will see that in the middle of each of them there is a chemical group called an indole group (Fig 5). In some of the more recent manifestations of synthetic cannabinoids this has changed to and indazole or even a pyrazole group. The synthetic cannabinoids basically consist of one of these chemical groups with diverse other things attached to it. The chemistry involved here is not all that challenging. There are virtually an infinite number of variations on this theme that might result in a potent synthetic cannabinoid. As illegal labs copy what drug companies and others have already done and produce more and more of these substances, they are also learning how to make them stronger and stronger, just like the illegal labs making derivatives of fentanyl that are stronger and stronger are helping to fuel the Opioid Epidemic. Now some of these super potent synthetic cannabinoids like AMB-FUBINACA, a synthetic cannabinoid originally patented by Pfizer, are starting to appear in Spice like products on the streets and are responsible for incidents like the one described in Brooklyn last year. There is really no end in sight to all of this. It is very difficult for analytical laboratories to keep up with the new variations that keep appearing or for the law to adequately capture conceptually what should be considered illegal in an a priori manner. Moreover, in the Opioid Epidemic, an overdose can always be reversed by an antagonist drug like naloxone, but there is no widely accepted antagonist for reversing the effects of synthetic cannabinoids in humans, although such things do exist and may be useful in the future. As I mentioned above, the vast majority of synthetic cannabinoids have never been investigated in man. The effects they produce probably result from ultrastrong activation of CB1 and CB2 receptors –but quite possibly other things as well. This is because we are now starting to realize that synthetic cannabinoids can also target other receptors including many “orphan receptors”. The description “orphan receptor” is really just scientific jargon for saying “we know that this receptor exists but we have no idea what it does”. So, using street versions of synthetic cannabinoids is really playing Russian Roulette with your life. When you buy a packet of Spice or other “legal marijuana” you really have no idea what it has in it or what its effects are going to be. Caveat Emptor!